The Detroit Historical Society’s Speakers Bureau connects corporate, non-profit, community and affinity groups to Detroit’s story and why it matters. Our speakers are local experts and scholars with deep knowledge of Detroit and regional history. 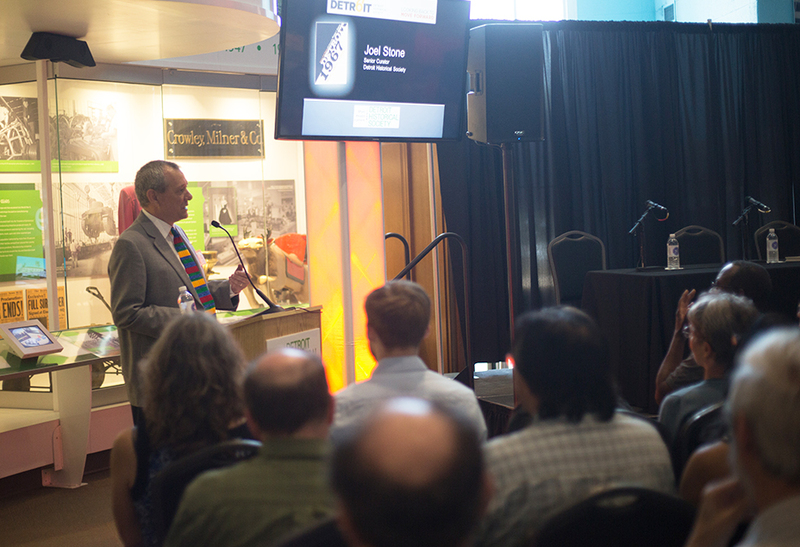 To keep our offerings relevant and exciting, we’ve launched our new “Featured Topics” series, which include speaker bureau experiences that highlight topics related to the Society’s current suite of changing and award-winning exhibits and programs. Presentations can run from 30-50 minutes in length and feature an array of historic images. Q&A afterward is encouraged. 2018-2019 Season of "Featured Topics"
• “Detroit 67: Looking Back to Move Forward” – Joel Stone, Senior Curator. Events that took place in the summer of 1967 had a significant impact on the people of Detroit and southeast Michigan. This presentation looks at the events of 1967 in their historical context and discusses how an extensive community engagement project was developed to address this important anniversary, and includes an award-winning exhibition and publication, successful oral history project, and over 180 partner programs. • “Myth of the Model City” – Billy Winkel, Assistant Curator. This presentation explores both the causes and events of the 1967 uprising. Understanding what led to the riot/rebellion is imperative to understanding the unrest. Additionally, this lecture will seek to dispel many myths that surround ’67. • "Cool Cars: Unique Automobiles of the Detroit Historical Society Collection" – Jeremy Dimmick, Manager of Collections. The Detroit Historical Society is caretaker of sixty automobiles. Most are rare – many are one-of-a-kind vehicles that exist in no other collection. These include the first closed salon Cadillac, the Scripps-Booth Bi-AutoGo, and a pre-production Mustang prototype. Several were the personal cars of the Auto Barons, and some came to the Society with original engineering drawings. This presentation takes a tour of a very unique automobile collection. • “Floating Palaces of the Great Lakes” – Joel Stone, Senior Curator. For 150 years Great Lakes steamboats offered passengers a level of comfort and safety unsurpassed on any waterway in the world. This presentation examines the growth of the industry and the development of the ships that supported it. Of course, the dining experience will be included. Speaking engagements are available Monday through Thursday for daytime and evening presentations or Friday during the day only. Detroit Historical Society presentations are available to corporations and businesses for $400, and to non-profit organizations and libraries for $250. If a Detroit Historical Society member is associated with the event, a $50 discount is available. For venues farther than 30 miles from the Detroit Historical Museum, we will add a $25 fee for each additional 10 mile increment. To book a speaker for your group, you can fill out and submit our online speaker request form below or call 313.833.1801. Thank you for your interest in the Detroit Historical Society's Speakers Bureau. Please fill out the following form to indicate your preferences for topic and your event’s date, time and location.